A tire swing and a plastic slide no longer cut it for today's kids. The City of Richmond, a suburb of Vancouver, has invested $1 million in its newest play area, which features a tandem zipline, 10-metre tall treehouse, and a rolling hill. The "adventure play environment" at Terra Nova Rural Park is designed to mimic, well, nature. The city says it purposely wanted a play area built among trees and former farm fields, near wildlife, and adjacent to the Fraser River to help reconnect people with nature — and have fun at the same time. The city collected suggestions from children during the design process. The area is being marketed as "a place for off-leash kids." Toddlers can get dirty in the water and sand play area or tire themselves out in a meadow maze, while older kids can soar above the ground on three-metre high swings or scamper up the treehouse complete with four platforms, a central rope ladder, and a spiral slide. 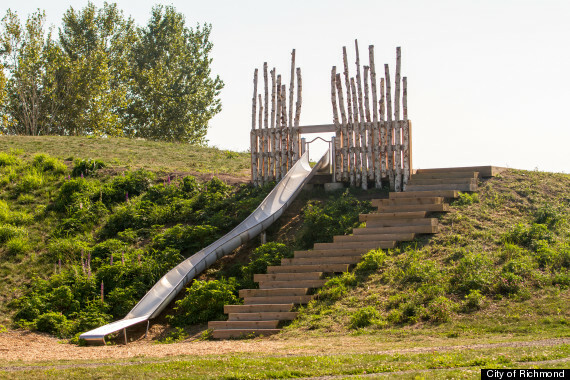 Children can also fly through the air on the 35-metre long ziplines or climb on the "log jam," a structure that mimics walking on beach logs. Since 2011, city hall has approved a total of $2.2 million for the playground itself as well as supporting infrastructure such as bathrooms and landscaping, reported the Richmond Review. Rather than metal and plastic, the play structures are custom-designed and manufactured using yellow cedar from B.C. and "sustainable design practices," said the city. A grand opening for the impressive playground is set for Sept. 27, according to Tourism Richmond, but the space is already bustling with little adventurers. Amazingly, this isn't Richmond's first million-dollar playground: the unique play space at Garden City Community Park opened in 2008. $1-Million Playground In Richmond, B.C.